“Let us celebrate THE PERFECT WRONG NOTE for its elegant, sensitive, and openhearted exploration into an enigmatic arena. Mr. Westney is refreshingly honest. . . [he] takes the reader on a journey through learning, problem solving, risk-taking, and healing. The book is infused with his affirming, empathetic, and encouraging attitude – whatever level you find yourself on, there is much to relate to and much to aspire to. The result is a wise, delightful book . . . every page rings true to my own musical, psychological, spiritual, and interpersonal journey of discovery . . . Read this book! “[Westney] has compiled a guide to spiritual, physical, and intellectual health – all framed within the lessons and practices of music. 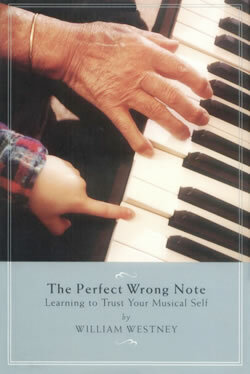 The book is a dance through the experience of life as reflected in making music. “The book is absolutely brilliant and I thank you for taking the time to offer your experiences in this way. I’ve learnt much about my own playing just by reading the first five chapters. I am greatly encouraged now that the possibility exists that all those ‘wrong’ notes that I’ve played over so many years were just perfect and now I can see them in that light. I’d never have considered this possible without your book. Thank you again and I hope that you will feel greatly encouraged to know that your words have helped a humble amateur pianist in England! “This may be the closest I’ve ever come to writing “fan mail.” But I recently came across your book in the music library at the University of Wisconsin – Madison where I am a graduate horn student. All I can think to say is THANK YOU THANK YOU THANK YOU. In just a few short weeks, I feel like I have finally grasped the concept of practicing. I feel like I finally know how to evaluate myself in a practice room so that I actually improve and don’t lose my self-esteem by the time I’m done! My practicing is more focused and more productive, and I feel so much better about my playing overall. Your chapters on teaching and artistry are wonderful. Your wiring is so concise and well thought out. With so many books about music and musical training, I’ve found either too much or too little information, and not always so well conceived. But not your book! The analogies are great, and I particularly enjoy the ones that are not music related. The analogies that relate music to, say, golf, help me to explain what studying music is like to my family and friends who aren’t musicians and don’t understand how I sit in a practice room for hours on end. I feel like I’ve been give a new vocabulary to talk about music. I’ve been telling all of my friends about your book. At the risk of sounding melodramatic, it has changed the way I think about music. Thank you so so so much.